Don’t do it!!! 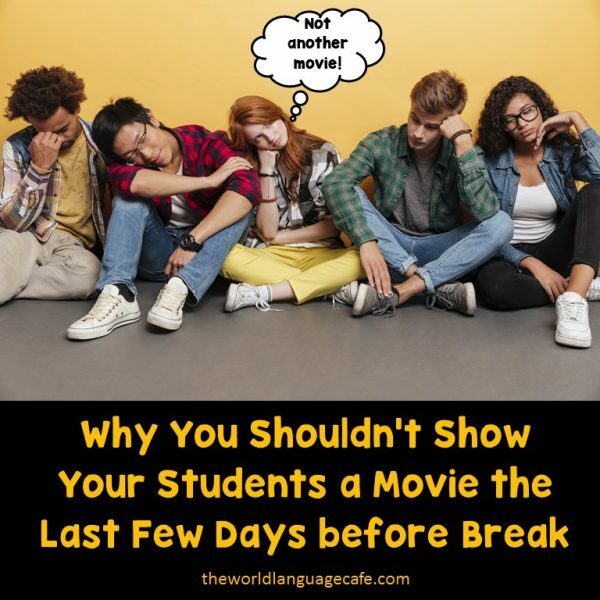 Don’t show your students a movie the last few days before a long holiday break! All the teachers do this and the poor students end up watching movies all day long. Save your movie for another time (when you’re feeling under the weather, when you have a sub, etc.). Here are 10 activities to save your sanity and keep your students engaged in the target language before a long break. 1. Introduce some new review games to spice up your classroom. Take some time to do a quick spiral review of the material that you have covered so far this year or pick a topic students struggled with and review it with a game. After sitting and watching movies all day or taking tests, your students will be psyched to play some active, engaging games. “But Sherry, I’ve already used up all my game ideas!” No worries! I’ve got you covered. Sign up now to get them and other language teaching goodies in my Free Resource Library. 2. Try a community building activity in the target language. 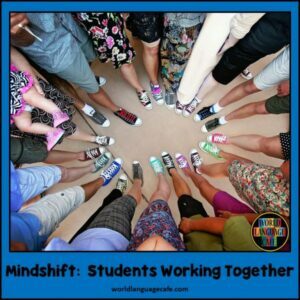 Want your World Language students to be global citizens who work together to solve complex problems as a group? I know it’s a little off the beaten path of grammar and specific language skills, but it’s the perfect activity for the day before a long break. Try “Mindshift”. Guaranteed that students will be talking about this activity for years to come. Read about how to set it up in your classroom here. 3. 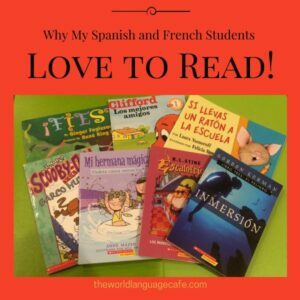 Pull out books in the target language and let students free read. Tell your students that you know this time of the year is so busy, that you thought they’d like a few minutes to sit quietly and enjoy a good book. Depending on the age of your students, let them read for 10-20 minutes (stop just before they start to get a little restless). Let them pick whichever books they would like to read. After your students have read for a while, then go back to tip #1 and play a game or two. 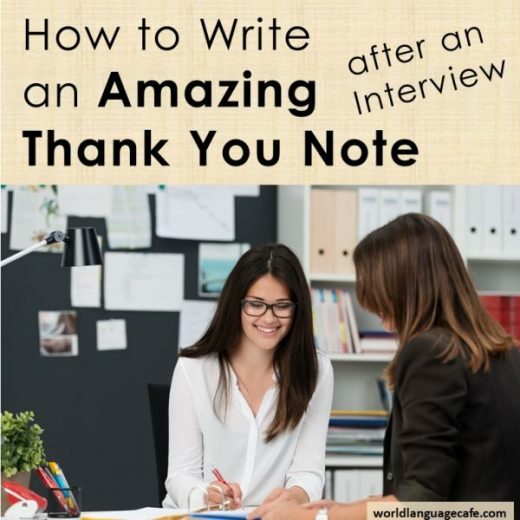 This will give you time to grade papers or tidy up so that you can leave with a clear mind and truly enjoy the holidays. You can also do this every day for 2-3 days or make it a regular weekly routine in your classroom. 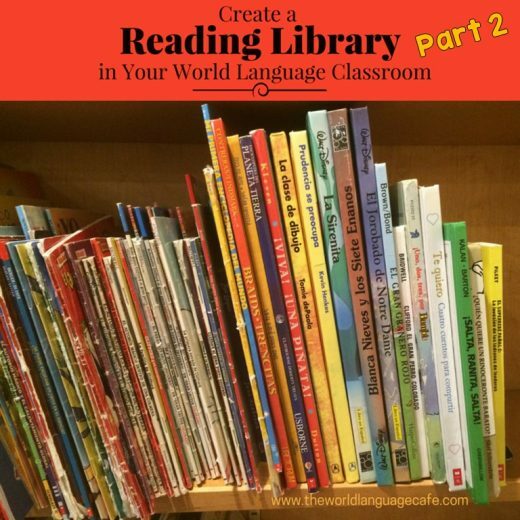 If you haven’t set up a World Language library in your classroom yet, read how to do it cheaply and easily here. 4. Try something new for free! 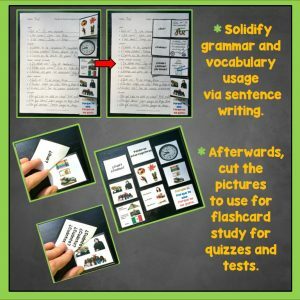 Have you tried trifold flashcards yet? 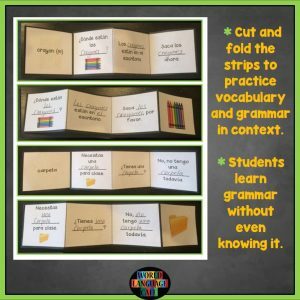 If not, I’m telling you – these are going to revolutionize the way you and your students think about flashcards forever!! The students love these. They’re a great way to reinforce verbs or vocabulary AND they make awesome sub plans. They’re available for vocab themes or verb tenses. Just print and go. Read more about trifolds and get free sets here. 5. 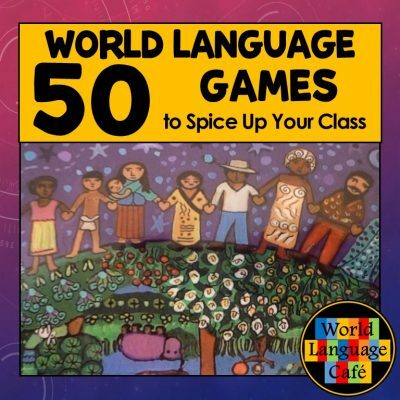 Create a language cafe and spend the whole day speaking in the target language. I strongly believe that this is one of the most valuable activities a language teacher can do with his/her students. 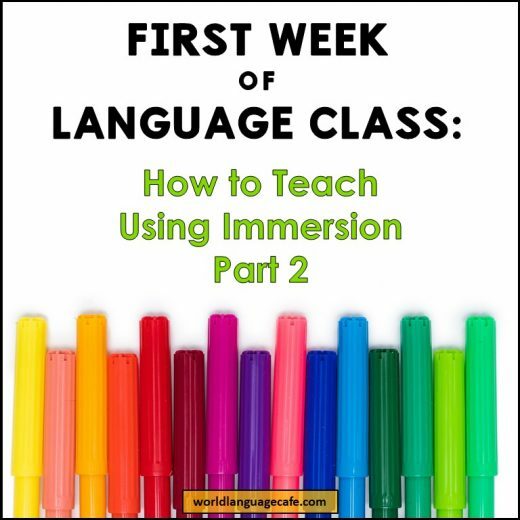 Get them talking about what they’re interested in, about current events, plans for break, or pose questions that will incorporate a grammar point, verb tense, or set of vocabulary that you’re practicing. Have students research recipes from the countries they are studying and in small groups prepare a special food to bring in to share. Students then talk about how they made the food and what ingredients they used. Teach students how to ask politely for food in a restaurant and practice good manners. Once everyone is served, start with “Temas y tapas” (your cafe chat while you’re eating). You can break students up into groups of 4-5 or sit in a circle as a class. 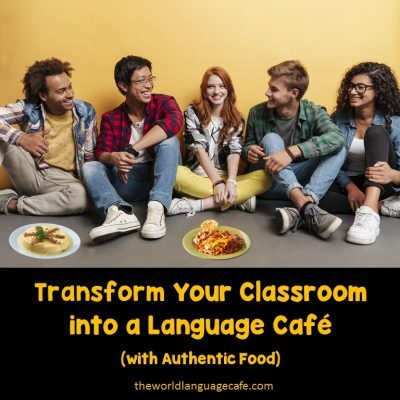 Transform your classroom into a language café. Read more about how to set this up successfully in my 50 free games. Access them in my Free Resource Library. Just enter your email at the bottom of this post so I can send you the link and password. Hope these ideas inspire you to try something different this year before break! Would love to hear if you have anything special that you do in your classroom.